The World Goes On (translated by John Batki, Ottilie Mulzet and George Szirtes, review copy courtesy of Tuskar Rock Press and the Australian distributors Allen & Unwin) is a collection of texts, some long, some fairly brief, divided into three parts (labelled ‘He Speaks’, ‘He Narrates’, and ‘He Bids Farewell’). The first section begins with a series of first-person accounts, many consisting of a single, mesmerising sentence, such as ‘Wandering-Standing’, a breathless piece in which the narrator describes having to get away from where he is, only for us to discover he never really left. ‘He Wants to Forget’ is a pessimistic lament of the modern era, while ‘The World Goes On’ is a terrified ramble inspired by the fall of the twin towers. The bulk of this first section is taken up by ‘Universal Theseus’, a series of three lectures given by a man who clearly doesn’t want to be there. As he discusses melancholy (! ), revolt and possessions, the audience watches on silently, allowing the guest to use anecdotes to illustrate his chosen topics. With Krasznahorkai, though, nothing as simple as it seems. Much of the appeal of the piece is the growing realisation that the speaker is being held against his will, an allegory perhaps of the illusion of free will in a world that entraps us. ‘He Narrates’, comprising two-thirds of the book, has a series of stories told in the third-person. There’s a familiar style about many of these pieces, with several featuring a man out in the world who is suddenly overcome by a sense of horror, an uncanny moment in which his sense of balance is destroyed. In ‘Nine Dragon Crossing’, for example, a drunk interpreter rendered dizzy by the rush and speed of Shanghai finds himself in the centre of a tangle of expressways. Having found himself alone at last, he loses his equilibrium completely, stranded in the middle of a modern version of Dante’s circles of hell. 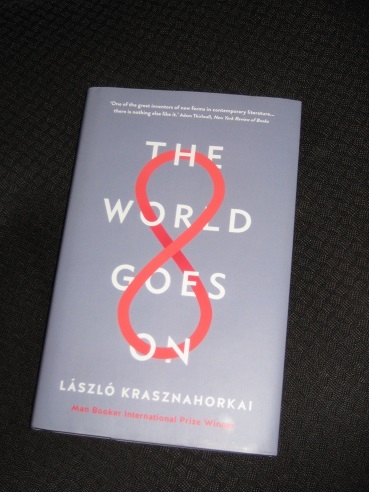 The World Goes On is replete with Krasznahorkai’s usual mesmerising fare, including the endless sentences and the bewildered, bemused protagonists wandering around in search of redemption, or at least relief from their existential pain. There’s an underlying theme of our having lost our way in the modern world – as life becomes ever bigger, ever faster, ever noisier, we wonder what exactly all this progress is for. Yet my overall impression was that it’s perhaps not as strong as some of his earlier works (it’s most akin in style to Seiobo There Below in that it’s a series of thematically linked pieces, but without hanging together quite as well), and a few of the stories are short rambles that went over my head. One piece I wasn’t overly impressed with was the penultimate ‘story’, ‘The Swan of Istanbul’, which consists of a collection of blank pages and some endnotes making up a brief vignette, for me crossing the fine line between clever and gimmicky. Overall, despite some of the usual brilliance, there’s a sense that this is more a collection of pieces than a coherent, cohesive work. The academic suspects that Gagarin’s slide into alcoholism was due to his realisation that this is it, all we’ll ever have, paradise on earth – we just can’t see it. And yet, the third section, a one-page farewell, takes a different approach. ‘I Don’t Need Anything From Here’ is exactly what it sounds like, a parting message from a man happy to leave everything behind in the knowledge that the world to come (‘Die Welt voran’?) will have everything he could ever need – a different view to that in the Gagarin story. It makes for a melancholy, comforting end to a book which, even if it doesn’t quite match up to some of the writer’s other works, shows a writer you really should make time for, and contains several stories I’ll be revisiting in the future.